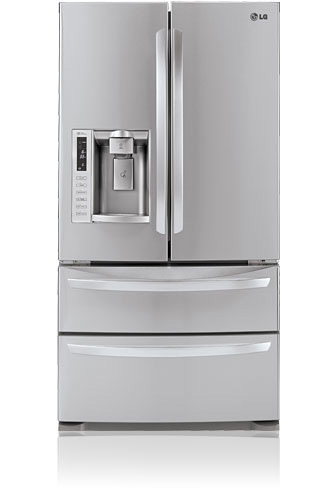 OVERALL: The LG LMX28988ST 4-Door French Door Refrigerator is one of our favorite LG French Door Refrigerator models. Partly due to its unique two drawer freezer drawer design. While we do love it, though we also found that the icemaker is a bit slow and the LED lighting inside is a bit bright but makes it easy to find what you are looking for. Otherwise, this refrigerator lives up to expectations -- with 28 cubic feet of space, double freezer drawers and a unique 13-inch tall ice and water dispenser. This LG Refrigerator has the Slim SpacePlus™ Ice System which frees up additional door bin space by putting the ice machine and dispenser in the door itself. The Tall Ice & Water Dispensing System allows anything from pitchers to pint glasses to fit within the dispenser unit. This may seem like a small thing but it's just one extra that's added to this fridge to cover all of your bases. Ultra-Large Capacity: With 28 cubic feet of space, this LG French Door refrigerator gives you more space than most LG fridges. You'll have ample space for all your food storage needs. Get rid of that spare fridge! Save money on energy and add convenience. With its Double Freezer Drawer you have easy access to those items you need to have on hand without having to open the entire freezer. With its contoured doors and Sleek design this refrigerator makes a perfect addition to any existing kitchen decor. The air flow issues that have plagued other LG Refrigerator models seem to have been mostly resolved, but there were still complaints from a handful of consumers about colder temperature zones where vegetables would freeze if not rotated properly. Colors: While we are reviewing the stainless steel version of this fridge, it also comes in smooth black and smooth white. Both of this colors also have a $200 less msrp than the stainless steel. If you're still not ready to buy a fridge, no worries. This process can be a lengthy one. It's always best to compare when making such a large purchase to be sure you bought the right one.